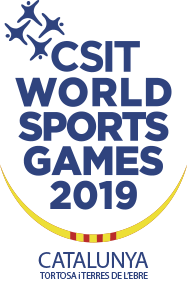 The IRV invites Gym Wheel and Cyr Wheel enthusiasts from all over the world to join us at the 2019 CSIT World Sports Games in Tortosa/Spain (02 to 07 July 2019). The IRV’s destination, L’Ampolla, is a 20- minutes bus ride away from Tortosa. Our venue (L’Ampolla Pavilion) and both hotels are directly at the beautiful beaches of the Costa del Azahar (see PDF file with venue and hotel information on www.rhoenrad.com), between Barcelona (north) and Valencia (south). Do you want to spend 5 days in a wheel? Learn new skills? Make new friends? Try wheel gymnastics for the first time? Practise what you already know? Then this is your chance to do just that! IRV open Gym- and Cyr-Wheel Workshops → organized and supported by e.g. the current Cyr-World Champion Hauke Narten (Germany) and other World Championship participants. The main focus of the Open Mixed Masters Team Challenge is on Fair Play and inclusion, as well as international interaction and mutual understanding in sport.